Insects can use plants as 'green phones' for communication with other bugs. A new study now shows that through those same plants insects are also able to leave 'voicemail' messages in the soil. Herbivorous insects store their voicemails via their effects on soil fungi. Researchers from the Netherlands Institute of Ecology (NIOO-KNAW) and Wageningen University (WUR) discovered this unique messaging service in the ragwort plant. The journal Ecology Letters will soon publish these results. A few years ago, NIOO scientists discovered that soil-dwelling and above-ground insects are able to communicate with each other using the plant as a telephone. Insects eating plant roots change the chemical composition of the leaves, causing the plant to release volatile signals into the air. This can convince above-ground insects to select another food plant in order to avoid competition and to escape from poisonous defense compounds in the plant. But the impact doesn't stop there. The new research shows that insects leave a specific legacy that remains in the soil after they have fed on a plant. And future plants growing on that same spot can pick up these signals from the soil and pass them on to other insects. 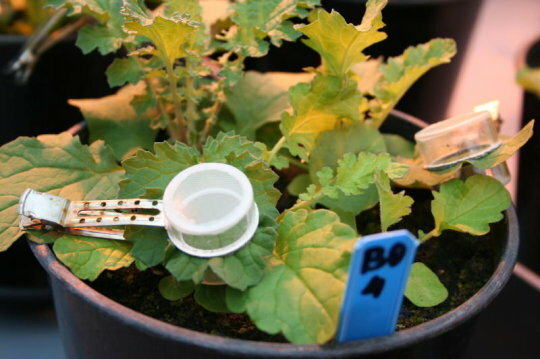 Those messages are really specific: the new plant can tell whether the former one was suffering from leaf-eating caterpillars or from root-eating insects. "The new plants are actually decoding a 'voicemail' message from the past to the next generation of plant-feeding insects, and their enemies," recaps NIOO researcher and first author Olga Kostenko. "The insects are re-living the past." This message from the past strongly influences the growth and possibly also the behavior of these bugs. Today's insect community is influenced by the messages from past seasons. Kostenko and her colleagues grew ragwort plants in a greenhouse and exposed them to leaf-eating caterpillars or root-feeding beetle larvae. Then they grew new plants in the same soil and exposed them to insects again. "What we discovered is that the composition of fungi in the soil changed greatly and depended on whether the insect had been feeding on roots or leaves," explains Olga Kostenko. "These changes in fungal community, in turn, affected the growth and chemistry of the next batch of plants and therefore the insects on those plants." Growth and palatability of new plants in the same soil thus mirrored the condition of the previous plant. In this way, a new plant can pass down the soil legacy or message from the past to caterpillars and their enemies. "How long are these voicemail messages kept in the soil? That's what I also would like to know!" adds Olga Kostenko. "We're working on this, and on the question of how widespread this phenomenon is in nature." The research project was financed by a personal innovation grant of the Netherlands Organisation for Scientific Research (NWO) to Martijn Bezemer from the NIOO. In the greenhouse of the Netherlands Institute of Ecology (NIOO-KNAW) plants and plant-feeding insects are put together to assess their ability to store "voicemail messages" in the soil. The NIOO is one of the largest research institutes of the Royal Netherlands Academy of Arts and Sciences (KNAW), with more than 200 employees and students. It is specialized in fundamental and strategic ecological research. Since early 2011 the NIOO is based in a sustainability built research laboratory in Wageningen, the Netherlands. This is seriously some very fascinating information and belongs to the same theme along the line of thought as the "Earth's Internet" or perhaps maybe "Earth's Interface". This seriously makes you wonder and realize the beneficial reasonings behind such agricultural farming techniques such as crop rotation. Abandoning the proven flawed Farming practice of monocropping. Stay tuned for more!